Based on an episode from the novel Il ponte della Ghisolfa by Giovanni Testori, Rocco e i suoi fratelli (Rocco and His Brothers) is the story of a family in Milan who deal with their surroundings where a man tries to maintain the unity of his family who deal with their new surrounding and its vices. Directed by Luchino Visconti and screenplay by Visconti, Suso Cecchi d’Amico, Pasquale Festa Campanile, Massimo Franciosa, and Enrico Mediola from a story by Visconti, d’Amico, and Vasco Pratolini, the film is an exploration of the life of a family struggling to be together amidst their need to succeed and find happiness. Starring Alain Delon, Renato Salvatori, Annie Girardot, Katina Paxinou, Spiros Focas, Max Cartier, and Claudia Cardinale. Rocco e i suoi fratelli is an evocative and rapturous film from Luchino Visconti. The film follows a family from Southern Italy who travels to Milan to join their eldest son to live in a new environment hoping they wouldn’t struggle yet they would deal with the demands of the modern world and the vices it would bring that would shake the unity of the family. It’s a film told in five parts as it feature five brothers who are from Southern Italy as they all try to make it in Milan with the youngest being a child with their mother Rosaria Parondi (Katina Paxinou) hoping the move would be a good change for the family. The film’s screenplay does have this structure that is told in five parts as it goes from the eldest son in Vincenzo (Spiros Focas) to the youngest in Luca (Rocco Vidolazzi) with the titular character Rocco (Alain Delon) in the middle. The first act revolves around Vincenzo being engaged to a young woman in Ginetta (Claudia Cardinale) and the second eldest in Simone (Renato Salvatori) trying to make it as a boxer where he falls for a prostitute in Nadia (Annie Girardot). The second act is about Rocco while the third is about the younger brother Ciro (Max Cartier) and Luca. When the Parondi family arrives to learn about Vincenzo’s engagement to Ginetta, it is a surprise where things don’t exactly go well forcing Vincenzo to be with his family and help them find a home and work for his brothers. When Ginetta becomes pregnant, Vincenzo would marry her as he would make the decision to be with Ginetta and their growing family leaving his mother and brothers to fend for themselves despite wanting to help them. It’s around this time that Simone becomes fascinated by boxing due to his physique but also wants more as he isn’t interested in doing menial work like Vincenzo and Rocco where he would meet Nadia and would do whatever to please her. Even if it means stealing from the laundromat that Rocco works at which would be the start of his own downfall from someone that was loyal to his family to becoming selfish and lazy. Simone’s development is crucial to the story as is Rocco who is this saintly figure of sorts that is doing whatever he can to help his family. Even if it means sacrificing his own happiness for the good of his family where the second act is about him doing his military service where he would meet Nadia a few years after their arrival in Milan. The second act wouldn’t just play into Rocco searching for his own place in life which also means having to reluctantly become a boxer as Simone’s trainer realize that Rocco has a lot more to offer to the sport than Simone. It’s also for the fact that Rocco is willing to help his family as well as try to mend fences between his mother and Vincenzo in order to meet his growing family. Yet, Rocco’s time with Nadia, who sees him as a way out of prostitution and immorality, would cause problems with Simone. The third act which begins with Ciro, who grows into a responsible young man with a steady job and a girlfriend, who begins to be the one providing for himself, Luca, and their mother as he would be forced to deal with Simone’s self-destructive lifestyle with Nadia that becomes too much for Rosaria to deal with. Ciro’s development is crucial in the third act as he started off as a teenager focusing on his studies and then become a man with responsibilities watching everything around him. Even as he has to be the one to guide his youngest brother Luca about the struggles they all have to deal with. 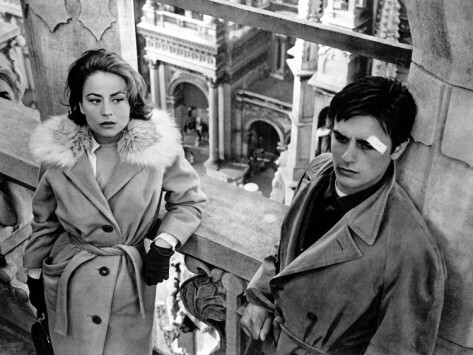 Luchino Visconti’s direction is definitely intoxicating for the way he captures life in early 1960s Milan as this epicenter of post-war modern Italy. Also shot on location near Lake Como, Visconti would create this world which would seem foreign to a family like the Pardoni who come from the rural landscape of Southern Italy where they had land that was their own despite the struggles they endure. In the city, they had to work harder to get a home and the things needed in a home. While there are a lot of wide shots that Visconti would use to capture the world of Milan and areas that represent this world that is modern as it’s filled with pool halls, boxing arenas, and posh hotels. Visconti creates something where it is a world that is enthralling but also a little off for characters like Rocco who had lived most of his life in the countryside which is a world Visconti doesn’t show at all. Instead, he opens the film with the Pardoni family, minus Vincenzo, arriving on a train station in Milan where they’re in awe of their new surroundings. While the setting of the film is quite vast, there is still an element of intimacy into the characters that Visconti is interested in as he would use close-ups and medium shots to get a glimpse into the life they have. Especially in the apartments where there’s a scene of Rocco coming into Vincenzo’s apartment late in the second act as it show the kind of life Vincenzo has which is what Ciro is aiming for while still living with his mother and Luca. The film’s third act is about this desire to return to the South as it’s something Rocco wants where he copes with all that he tries to do for his family including Simone who would constantly put the family into shame. Especially in the film’s climax where all of the goading he gets for his troubles would finally test Rocco in his desire to help and forgive with Ciro having to tell Luca about what he would face as well as the realities of what is to come if the family ever returns to the South. Overall, Visconti creates a ravishing yet visceral film about a rural family dealing with modernism, sacrifice, and major challenges in the big city. 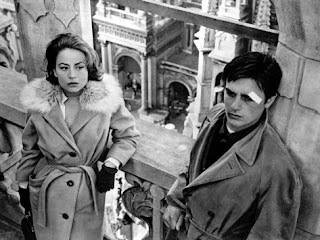 Cinematographer Giuseppe Rotunno does incredible work with the film’s black-and-white photography to capture the look of modern Italy from the sunny look of the scene outside of the hotel to low-key approach of lighting for the boxing scenes as well as a scene where Simone confronts his former manager. Editor Mario Serandrei does brilliant work with the editing as it emphasizes on a lot of the dramatic elements with its usage of rhythmic cuts to play into some of the intense moments as well as stylish montage of sorts for a key sequence in the third act. Production designer Mario Garbuglia does excellent work with the look of the apartment that the Pardoni family would live in as well as some of the places the brothers would work at and the gym where Simone and Rocco would train. Costume designer Piero Tosi does terrific work with the costumes as it play into the ragged look of the men early on and the clothes they would wear in the coming years to the fabulous dresses that Nadia would wear to play into the lifestyle of decadence that she craves for. The sound work of Giovanni Rossi is superb in capturing the atmosphere of the city from the things heard from afar as well as some of the raucous sounds at the gym and the apartment building Rosaria would live in. The film’s music by Nino Rota is phenomenal for its lush orchestral score as it play into the melodrama while creating themes that range from being upbeat to using more heavy strings for the eerie moments in the drama as it is a highlight of the film. The film’s marvelous cast feature some notable small roles from Alessandra Panaro as Ciro’s girlfriend, Corrado Pani as Simone’s friend Ivo, Claudia Mori and Adriana Asti as a couple of laundromat workers who flirt with Rocco, Suzy Delair as the laundromat manager, and Paolo Stoppa as Simone’s manager Cerri as a man who discovers Simone and sees his potential only to find himself into trouble when Simone descends into alcoholism. Claudia Cardinale is fantastic in a small role as Vincenzo’s fiancée Ginetta as a young woman that is willing to be part of Vincenzo’s family despite the mistreatment they received from her family. Rocco Vidolazzi is terrific as Luca as the youngest of the five brothers who is often with his other as he would observe everything around him while having to bear the responsibility of what he will need to do when he gets older. Spiros Focas is superb as Vincenzo as the eldest of the five brothers who is trying to create a family of his own while doing whatever he can to help his mother and brothers. Max Cartier is superb as Ciro as the second youngest of the five brothers who spends much of the film observing his older brothers while trying to make his own mark in his life where he also voices his opinions about what to do. Katina Paxinou is excellent as Rosaria Pardoni as the mother of the five brothers who frets over the situation of the family while hoping they would get a good life as she wonders if the move to Milan was a good idea. Annie Girardot is brilliant as Nadia as a prostitute who is a woman that lives a decadent lifestyle that has her bringing in some bad vices to Simone until she would fall for Rocco where she hopes to make some changes in her life until Simone wants her back. Renato Salvatori is amazing as Simone as the second eldest brother who is eager to succeed in the city where he becomes a boxer but succumbs to his infatuation with Nadia that would eventually be his downfall as he becomes selfish, lazy, and destructive in the shame he would bring to his family. Finally, there’s Alain Delon in a tremendous performance as Rocco Pardoni as the middle brother who is trying to do what is right for his family as well as maintain order including helping Simone with his troubles as it’s a very restrained performance from Delon that is filled with anguish and humility. Rocco e i suoi fratelli is an outstanding film from Luchino Visconti. Featuring a great cast led by Alain Delon as well as great visuals, Nino Rota’s sumptuous score, and a heartbreaking story on family dealing with the modern world. It’s a film that explores the life of a family trying to start over in a new world that demands so much and filled with vices that would test their unity. In the end, Rocco e i suoi fratelli is a magnificent film from Luchino Visconti.